Enjoy the best of both worlds with extensive SPA and Conference facilities at the exceptional 5 Star hotel Holiday Inn Sofia, Bulgaria. Just 10 minutes from Sofia Airport and Sofia City Center on the hotel’s shuttle bus, the hotel is ideally located in the foothills of the Vitosha Mountains within close proximity of Sofia city centre. Winner of numerous international awards including the Intercontinental Hotels Group Torchbearer Award in 2009/10/11/12/13 and the Tripadvisor…… Award 2013, the Holiday Inn Sofia is proud of its unrivalled levels of standards and service. 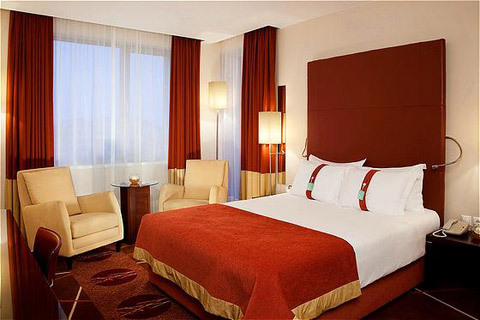 The Holiday Inn Sofia offers luxurious spacious bedrooms, including Executive Rooms and Suites, many with breathtaking views of the imposing Vitosha Mountain. The Holiday Inn Sofia provides a variety of gourmet dining experiences, ranging from a seasonal A la Carte menu or quality bar meals to a variety of delicious lunch and dinner buffets. We are certain you will enjoy the “Esprit Fitness & Spa”, including a 19m Pool with separate children’s Pool, indoor & outdoor Jacuzzi, Sauna, Steam Room, Gym and Solarium, not to mention our numerous Treatment Rooms for those who prefer to relax and be pampered. The hotel offers 130 tranquil spacious bedrooms, including Executive Rooms and Suites, many with breathtaking views of the imposing Vitosha Mountain. All hotel rooms are en suite with separate bath and shower, and provide air-conditioning, LCD flat screen TV with wide selection of satellite channels, courtesy tray, mini bar, hairdryer, ironing board and bedroom safe. There is a comfortable work desk and high-speed wired and wireless (Wi-Fi) Internet access available throughout the hotel. 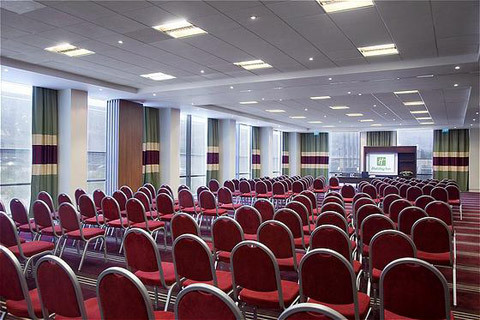 The Hotel’s Academy Conference Centre offers space for meetings and conferences of all sizes. We offer over 1,000 sq. meters of flexible meeting space throughout the self- contained conference floor, combined with the services of a dedicated Events Host to ensure all your requirements are attended to. Functions of between 2 to 300 delegates are welcome. Holiday Inn Sofia offers consistently high levels of service & quality and advanced Conference technology to define the meetings and conference facility. The exceptional interior designed banqueting suites accommodate functions for between 2 to 260 guests. The hotel offers consistently high levels of standards and quality which, combined with the personalized service of a dedicated Events Host, and flexible lunch and dining options, adds up to the ideal choice for your event. 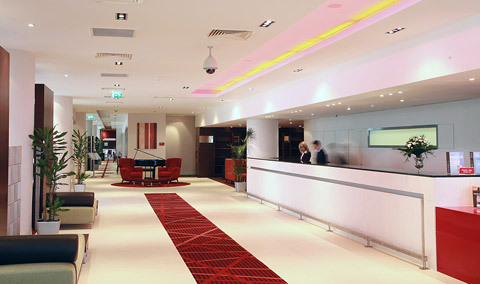 Holiday Inn Sofia is preferable place for a Wedding Celebration, Christmas Party, Recognition Awards, Graduation Ball, Association Dinner and Christening Service. 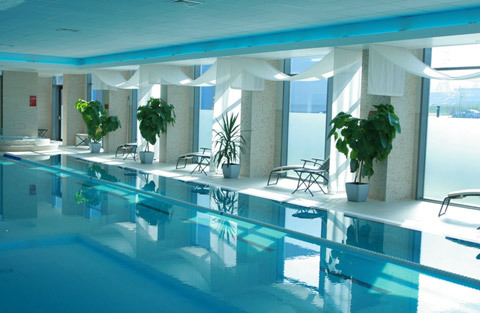 Esprit Fitness & Spa facilities are the finest in Sofia with a 19m indoor Pool with separate children’s Pool, indoor and outdoor Jacuzzi, Sauna, Steam Room, large Gymnasium with Technogym equipment, Solarium and series of tranquil Treatment Rooms with range of pampering Spa treatments. The modern air conditioned gym is equipped with the latest TechnoGym equipment to ensure that you always get the most from your workouts. Plunge into the crystal clear water at Esprit. It offers a 19 meter indoor swimming pool and relaxing pool area with comfortable loungers. The aromatic Steam and Finnish Sauna, heated to your choice of temperature, will melt away all your stress and tightness. 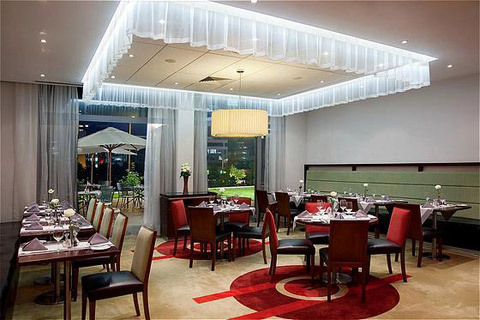 The 5 star Holiday Inn Sofia provides a variety of gourmet dining experiences, ranging from a seasonal A la Carte menu or quality bar meals to a variety of delicious and highly popular themed lunch and dinner buffets. The Brasserie Restaurant & Terrace is one of the most modern and stylish restaurants in Sofia. The Brasserie including outdoor terrace is open throughout the day for a tranquil breakfast or romantic dinner, with views of the Vitosha Mountains and the adjacent lake. Casual but elegant, for those desiring an inventive twist on classic international and local Bulgarian dishes in an informal atmosphere. Chi Bar is the perfect venue for enjoying a quality bar meal, holding impromptu business meetings or just relaxing over an espresso or your favourite cocktail whilst listening to the hotel's talented resident pianist., Razvigor Popov. 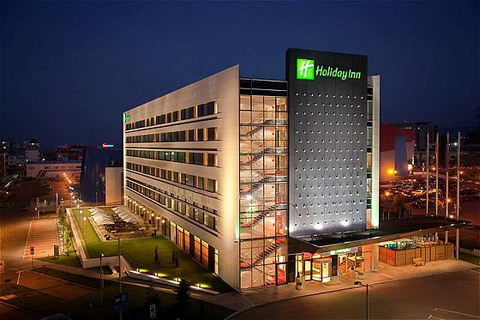 Holiday Inn Sofia is a mere 3 hour flight from all major destinations in Europe, Russia and the Mediterranean region. The fact that the major transport corridors 4, 7, 8, 9, 10 and TINA pass through the country makes Bulgaria the junction that connects the European Union & EFTA with Russia & CIS, Turkey and Middle East. With superb transportation links, the hotel is also a mere 5-10 minutes from Sofia Airport via the Holiday Inn Sofia Shuttle Bus. The strategic geographic location of Bulgaria and its capital Sofia, make the city a natural choice for major regional European, Middle Eastern and African meetings and conferences. Enjoy shopping at the biggest shopping centers in Sofia – IKEA, The Mall and the Sofia Ring Mall, concerts and sports events at Arena Armeets Sofia, only a 5-10 minute taxi or shuttle bus ride. Don’t forget that the Holiday Inn Sofia is also just 10 minutes away from Inter Expo Center - the biggest exhibition center in Sofia, Bulgaria and next to Residantial Park Sofia. A full list of events can be found in our News and Events page. If you arriving from Sofia International Airport, exit the airport and follow Bryuksel blvd for app. 2 km. Go through the underpass which leads onto Alexandar Malinov blvd, follow this road for approx 4 km and you will see the Holiday Inn Sofia on your left. From the central railway station - distance: 11 km / 6.84 mi south east to hotel. How to reach the hotel by car from Tsarigradsko Shosse Blvd - Take the Mladost exit and continue straight on Alexander Malinov Blvd. Follow this road for approximately 4 km & the Holiday Inn Sofia will be on your left.